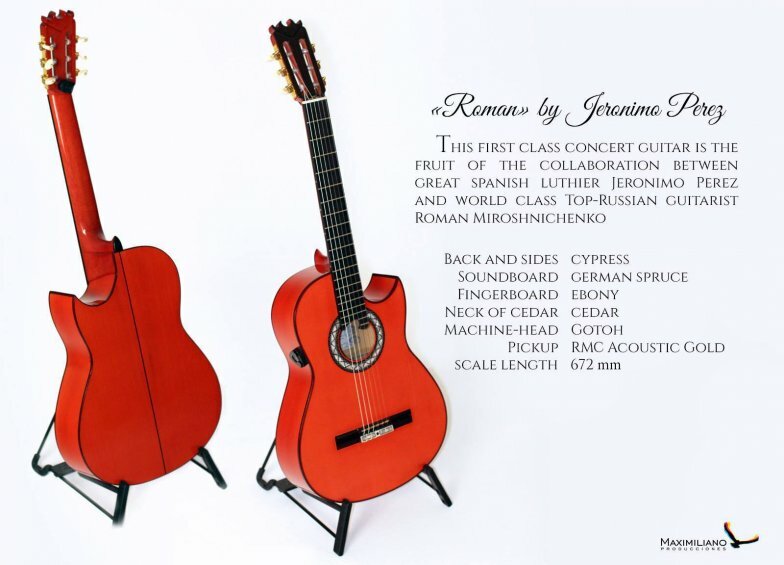 Flamenco midi-guitar "ROMAN" signature model custom build by Spanish luthier Jerónimo Pérez. This guitar is the exact replica of a model custom built according to the celebrated Russian guitarist Roman Miroshnichenko’s specifications. In essence this is a cross between our high end classical and flamenco models built in the best quality mountain cypress and German spruce finished by French polish method. Apart from its great sonorant qualities, this guitar stands apart for its characteristic pointed cutaway and one additional fret, increased measure, providing an ideal tuning and an advanced method of piezo-midi saddles installation. The standard edition of this guitar comes with the RMC Poly Drive II pick up system.